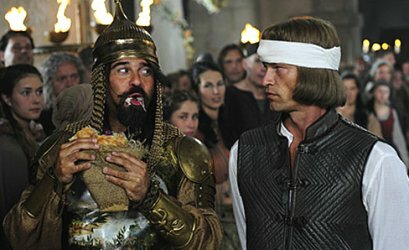 Scheda: Nazione: Germania - Produzione: Barefoot Films, Lionheart Entertainment, Warner Bros. - Distribuzione: Fox-Warner, Warner Bros. Pictures - Soggetto: Oliver Philipp, Oliver Ziegenbalg - Sceneggiatura: Oliver Philipp, Oliver Ziegenbalg - Fotografia: Christof Wahl - Montaggio: Charles Ladmiral, Olivia Retzer - Art Direction: Jens Löckmann - Scenografia: Christian Schaefer - Arredamento: Gernot Thöndel - Musiche: Stefan Hansen, Dirk Reichardt, Martin Todsharow - Effetti speciali: Scanline VFX - Formato: Color - Durata: 115'. 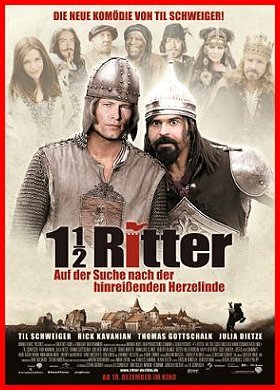 Cast: Til Schweiger, Julia Dietze, Rick Kavanian, Thomas Gottschalk, Udo Kier, Fatih Akin, Gode Benedix, Roberto Blanco, Gregor Bloéb, Ken Duken, Hannelore Elsner, Dieter Hallervorden, Johannes Heesters, Sigo Heinisch, Ralph Herforth, Maddalena Hirschal, Zora Holt, Charly Hübner, Mark Keller, Torsten Künstler, Zarah Jane McKenzie, Tobias Moretti, Anna Maria Mühe, Stefanie Stappenbeck, Thierry van Werveke, Justus von Dohnanyi, Tim Wilde, Fahri Ogün Yardim. 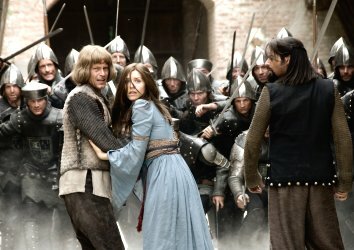 Trama e commenti: it.wikipedia.org - bluewin.ch: «Parodia delle classiche fiabe medievali in cui un timido e maldestro cavaliere ha l'occasione di diventare un eroe, partendo alla ricerca della figlia del Re che è stata rapita. 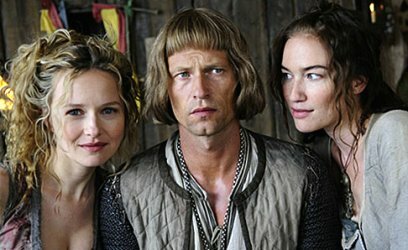 Commedia che riunisce un gran numero di star tedesche del piccolo e del grande schermo. 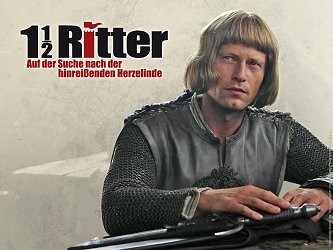 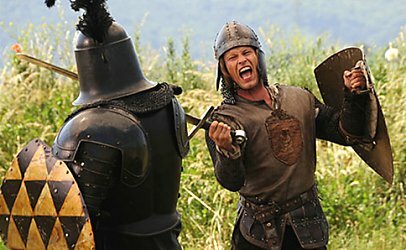 Fra queste solo Til Schweiger, qui regista e attore principale, è conosciuto al di fuori del paesi di lingua tedesca, per aver già recitato in King Arthur e Lara Croft». 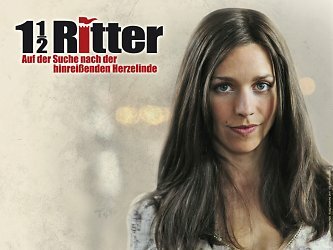 Plot Summary, Synopsis, Review: IMDb - movies.nytimes.com - filmstarts.de - movies.yahoo.com - spielfilm.de - kino.de - movienerd.de - critic.de - film.com - fancast.com - cineman.ch - allmovie.com: «With an approach that recalls such outings as Monty Python and the Holy Grail (1974) and Robin Hood: Men in Tights (1993), Til Schweiger's zany farce 1 1/2 Knights - In Search of the Ravishing Princess Herzelinde concerns two knights who set out on a heroic mission, to rescue the kidnapped Princess Herzelinde. 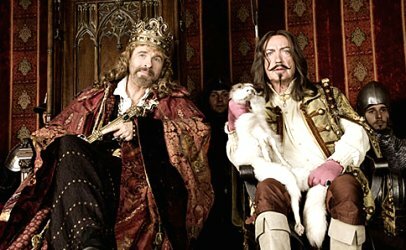 Given their propensity for klutziness, however, the expedition soon turns into a gag-filled comedy of errors» (Nathan Southern). 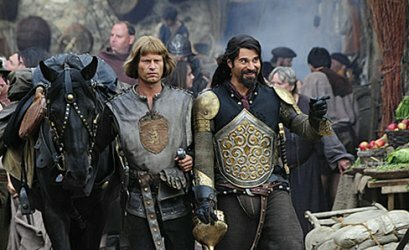 Conosciuto anche con i titoli: 1 ½ Knights - In Search of the Ravishing Princess Herzelinde; Zwei Ritter geben Vollgas.